To qualify for the rigors of the , recruits must meet fitness standards, and enlisted Marines must maintain a high level of physical fitness throughout their tour of duty. To that end, the Marine Corps has introduced updates to its fitness requirements, which include new requirements for the physical fitness test (PFT), (CFT) and limits on the percentage of . Rather than measuring weight alone, the Marines and other branches of the military consider the percentage of body fat based on height and age, and on measurements of neck and waist circumference. Female Marines are also subject to hip circumference measurement. The most recent changes to the body fat percentage limits increased the height and weight standards for female Marines and allow Marines who achieve high scores on the PFT and CFT to be exempt from the height and weight standards. So for example, if a Marine's maximum allowed body fat percentage for his age and height range was 19 percent, but he scored above 250 points on both the PFT and CFT, he would be allowed a body fat percentage of 20 percent. These changes were made because the Marines realized that when someone exercises vigorously to get into top physical condition, he or she will often add bulk in the form of muscle. That's a big part of the reason for the Marines moving toward using more precise measuring devices to measure the neck, waist and hip circumferences. Also, waivers for the body fat requirements can now be given by the first general officer in a Marine's chain of command. Previously such waivers were only available from the deputy commandant of Manpower and Reserve Affairs. 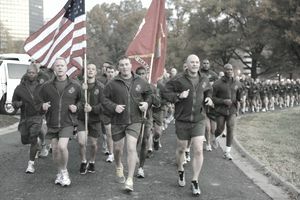 The Marines also expanded the number of age ranges contained in its fitness requirements. Marines used to be divided into four age ranges, but are now separated into eight different age groups. The report that recommended this change stated there was "no scientific basis" for the four age ranges, a system that had been in place since 1956. Here's an example of where the new body fat requirements and age ranges will make a difference. A woman in her late 30s will be allowed to have 28 percent body fat instead of the previous cut off of 27. Men 36 and older are permitted to have 20 percent body fat, previously allowed only for men 40 and older. Below is a chart of the , divided into the new age ranges. Marines who exceed the body fat standards are placed into a body composition program to help them achieve their fitness goals. But those who repeatedly fail to maintain required body fat standards may be subject to administrative sanctions which can include reprimands, denial of promotions, administrative demotion in rank, and even administrative discharge.